Trader Joe’s – One up’ing the Amish. We may have left Trader Joe’s season of pumpkin madness behind, but it is still autumn and that means there’s still a whole cornucopia of harvest foods to review. Case in point, Trader Joe’s tasty Cranberry Apple Butter. Every season has certain foods associated with it – from the lemonades of summer to the hot choclate of winter, but no season is more intimately tied to food and food traditions than the fall. There are the pumpkins, of course, but that’s not to mention turkeys, pies, stuffing, cranberries, apples or many more besides. Trader Joe’s has decided to take these latter two and combine them into one delicious condiment for us with their new Cranberry Apple Butter. Apple Butter is one of those niche condiments that the majority of Americans maybe encounters once or twice in a decade. In it’s most basic form, it can be thought of as something like apple sauce MAX. Apple sauce is made by stewing up a load of apples with sugar and water until it forms a pleasant mash. Apple butter simply takes that process to it’s extreme – keeping the apple sauce on heat until the fructose in the apples caramelizes into a rich, deep brown. This apple spread was first concocted by German and Dutch monks back in the Middle Ages, when monasteries included large orchards. The enormous, annual crop of apples had to be managed somehow, and what couldn’t be eaten was turned into the shelf stable apple preserve we now know as apple butter. Although it never really caught on in Europe outside of the regions of the Rhineland and Limburg, migrants to America brought the recipe with them and it can be found nowadays as a staple in Pennsylvania Dutch country, as well as more widely available in boutique grocery stores here and there nation wide. Of course, you and I know that’s stupid, as butter is only seldom that easy to spread. If we’re going strictly by consistency Apple Margarine would have obviously been the better term – or maybe Apple Toothpaste. At any rate, it’s in the history books know and I’ll be damned if I know what can be done about it. Trader Joe’s, on the other hand, had no such shortage of ideas. In a rather clever move, they’ve gone and added a heavy dollop of cranberry puree to the tradition apple butter, giving the condiment a tart zest. How much of a dollop are we talking about? Plenty, actually. 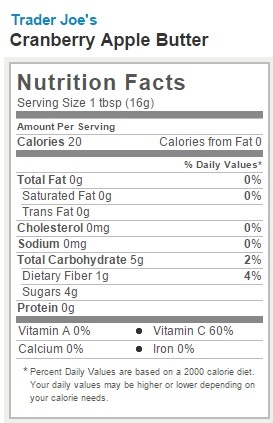 Cranberry is actually the primary ingredient in the spread, followed by apples. That’s a choice you can taste – the cranberries are front and center here, in fact they taste so strong that this apple butter could be mistaken for cranberry sauce on first blush. However, once the sharp cranberry taste has subsided, the mellower sweetness of the apple butter remains, taking some of the bite off and making the preserve more palatable than a straight cranberry sauce would be. Although it’s the “apple butter” part of the title that catches the attention, this is probably better thought of as a cranberry sauce first, and an apple butter second. So what do you do with a hybrid cranberry-apple spread? Put it on your turkey is the obvious answer. And while this would be a perfect addition to Thanksgiving dinner this year, it also makes a tasty spread on toast and English muffins. If you wanted to get crazy with it, you could even add it to a turkey sandwich for a little of that pseudo-thanksgiving taste! Would I Recommend It: Sure, if you like cranberry sauce. Would I Buy It Again: Probably not, honestly. Regular cranberry sauce usually does it for me. Final Synopsis: Like cranberry sauce, with a mellower apple butter follow through. I always enjoy reading your product reviews. I’d enjoy reading them even more if you’d stop using “it’s” where you mean “its.” Like fingernails on a chalkboard, that. Looked for cranberry apple butter today. I was told that it was discontinued. Why? 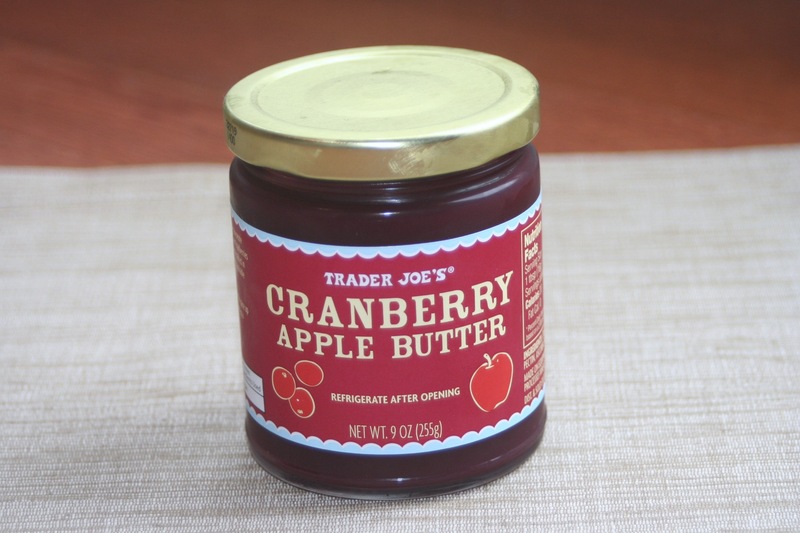 So sorry that Trader Joe’s has discontinued their CRANBERRY BUTTER which they usually at or thaNksgiving season. Was my favorite . Where can I buy it or find it? I want my cranberry apple butter. where can I buy it now that trader joe’s has discontinued it?